Those of us in the U.S.A. awoke this morning to news of yet another forthcoming release from Pelikan. The company is once again going retro with the introduction of a new model in the M101N series. Perhaps it is no coincidence that such a pen is being brought to light during the 90th anniversary of Pelikan’s first foray into fountain pens. 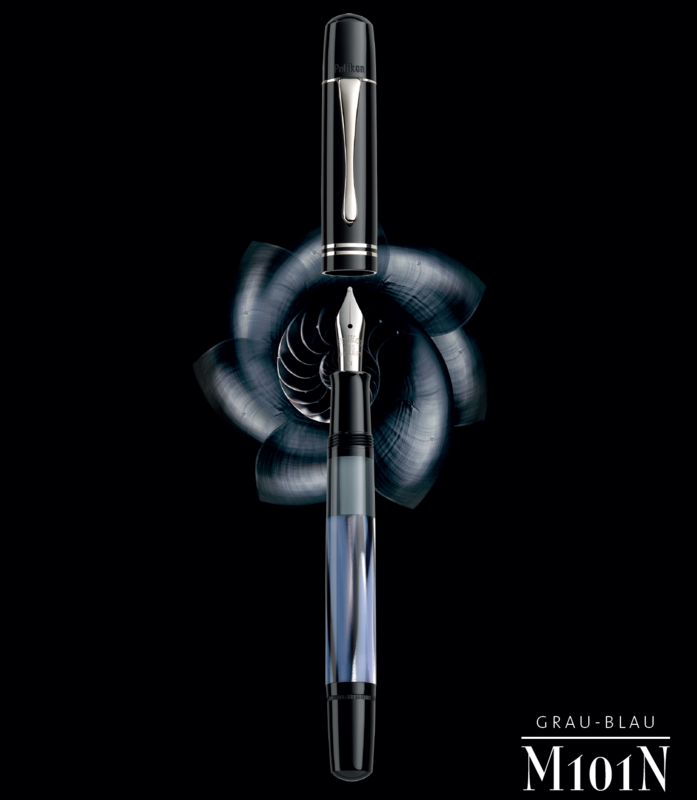 The newest M101N on the block has been dubbed the Grey-Blue and it will become the fifth pen in a line that takes its inspiration from the historic models of the 30s and 40s. To date, the Grey-Blue has been preceded by the Tortoiseshell Brown (2011), Lizard (2012), Tortoiseshell Red (2014), and Bright Red (2017). Whereas the first three models listed emulated some of the more popular vintage finishes, the Grey-Blue will join the Bright Red in blazing its own trail as a fresh take on an old design. Pelikan’s promotional materials state; “The grey and blue color and pattern is reminiscent of the original historical model of the 1930s,” but I do not recall any historic 101N ever having come in this color scheme. If you cannot wait to get your hands on this one, be thankful February is a short month as these are due to make their way to market sometime in March. The M101N Grey-Blue will sport a barrel made of cellulose acetate done in a marbled pattern of its name sake colors. The cap, section, and piston knob will be made of a high-quality resin done in black. The furniture will include a tear drop clip and two cap bands plated with palladium. Like the Lizard from 2012, the nib will have a monotone silver appearance owing to a rhodium plating atop 14-carat gold. The nib motif eschews the logo nibs popular since 1954 in favor of a script style more true to the original design. The available nib widths will include Pelikan’s standard EF, F, M, and B (keeping in mind that EF now carries an added premium). To round out the pen’s look, the cap top will depict the company’s single chick logo and a grey translucent ink window will be present just above the section. 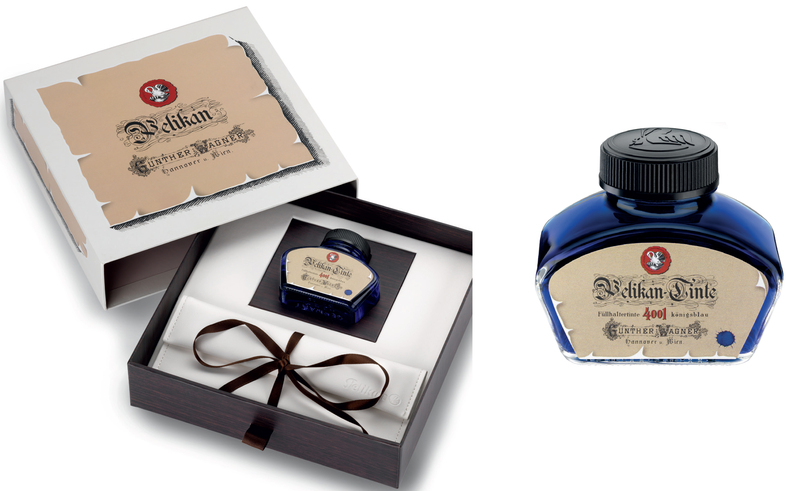 The Grey-Blue will come packaged in a special gift box that includes a bottle of 4001 Royal Blue ink. The box and ink will both feature a historic motif (but nothing that we haven’t seen before). This release will be a special edition therefore it will only be around for a limited time. As far as pricing goes, the U.S. MSRP is $685 with a retail price of $548. That is the highest asking price to date for an M101N in the U.S. The 2011 Tortoiseshell Brown debuted with an MSRP of $550 and a retail of $440 whereas the more recent Bright Red carried an MSRP of $650 and a retail price of $520. I guess the pricey just keep getting pricier. The EU MSRP is €495 which means those of us from outside of the EU shopping overseas (and thereby foregoing domestic warranty support) can expect retail prices of between $425-470. On a side note, Pelikan’s Facebook page has two recent postings about the Herzstück 1929 declaring availability starting in April which is a change from the previously stated March timeline. I wonder if the Grey-Blue has bumped it to a later release date though I haven’t been able to confirm that. What do you think about the M101N Grey-Blue? I have seen a few people point out that it looks more like an M200 with its marbled finish and I can’t really dispute that. I think that the few pre-release pictures made available to date are somewhat underwhelming and hope that the actual pen is more striking in person. Still, I’m sure that many will be happy to add this one to their flock, particularly those trying to keep the set complete. I anticipate that this may even sell better than the Bright Red from two years ago. Of course, the price tag stands a good chance of crippling this one, at least domestically, particularly when you factor in over a $150 price difference between retail in the U.S.A. and EU. Personally, I’m not immediately sold on this one and will await to see it in real life before passing final judgement. « Does Homeowners Insurance Cover My Pen Collection? 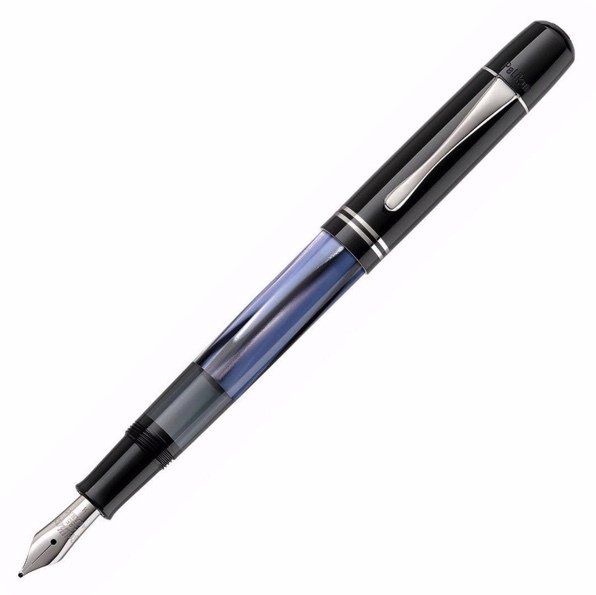 Beautiful pen, but at over double what I paid for my M400 White Tortoise I will have to pass. Even the EU pricing is roughly double. And that is counting shipping from the UK to Utah and the exchange rate from GBP to USD. Prices will vary and I think over time better deals may be had. Guess it will depend on how well it sells and if a lot of stock remains in retail channels after the first wave of purchasers. It still will likely be an expensive proposition, just a little less so. The M101N may be my single favorite modern Pelikan line, so I certainly have some interest in this new one. However, the stock photos shown so far are very underwhelming. I’m not overly concerned about the price; I think deals will be found on this pen soon or later. My guess is that like the Lizard, it will prove to be less popular than the Brown and Red tort M101Ns. I too love the size and look of this one. I think that the Tortoiseshell Brown remains the most popular of the group so far and will be interested to see the public reaction to this one. It’s been a mixed bag so far. I’m hoping the photos just aren’t capturing the finish well. I agree about the T. Brown being the most popular. It isn’t hard to see why as it is a gorgeous pen. I suspect the Lizard is the least popular (or just barely ahead of the Bright Red) but it is actually my favorite of the line so far. I have heard a lot of people say that about the Lizard. I have the Bright Red M101N and when I got that one, I fell in love with the style. I like the smaller size, and the color of that pen just makes me happy when I use it. Since I came to the party a little late, I’m now looking at getting the Red Tortoiseshell M101N. However, when I compare those bright, beautiful colors with this new one, I’m a little unimpressed. I prefer gold tone trimmings and brighter colors, so this one just isn’t doing it for me. Yet. I’ll give it a while and see if it grows on me. But I’ve gotta say, I’m in no rush. We’ll see. Meh. Compared to the Tortoiseshell Red and Bright Red, this is definitely more of a muted and austere look. Could provide for some nice contrast though and balance out the collection. Waiting to see it in person before judging it too harshly. Not having an M101N in my tiny pod of Pelikans, which of the Souverans does it compare to in size? The Gray-Blue is at worst the understated member of this series, which with the current discounts make it attractive to a pauper like me. Capped, the M101Ns are slightly shorter than M400s. It’s a small pen when capped, just shorter than an M400. That allows it to be ultra portable and it fits perfectly in the pocket. The beauty of the design is that these were made to be posted. The size and balance become near perfect with posting. Although I have the set so far, the price of this has killed it completely for me. It’s going to cause my compulsive collecting urge some anguish but I think I’m going to pass on this one. Unfortunately, the pricing has been an ever increasing problem for Pelikan. I just wonder at what threshold do they start turning customers away? I absolutely love this one, personally. I’m all in favor of moody, muted colors like this. But I am also thinking that with the price it will likely be a no-go. Depending on how it sells, we may see some deeper discounts down the line so keep an eye out. Although I have the current models, bar the lizard with the diamonds, I’ll not be bothering with this latest release. I’ll wait until they decide to return to more traditional/historical colours – or until hell freezes over; whichever is the sooner! I appreciate that they are bringing new colors to an old look but there still is something special about the originals. I think that was part of the success of the Tortoiseshell Brown. The gray-blue (grey-blue?) binde is right up my alley, although I share others’ concerns that it might keen too close to that of my marbled blue M200 (earlier version). The pricing sets me back, figuratively and possibly literally. After the first rush of happiness at the binde’s coloring, return views to the first images leave me wondering if the overall look might be too austere, perhaps even sterile. I am now in the “see in person” camp, hoping for discounts down the line if I find I really like it. My favorite so far is the Tortoiseshell Brown (so ugly, it’s cool! ;-p)– at which I seem to be in good company, and without a M101N. Cheers. The prices quoted for the earlier models don’t reflect current pricing. I bought my red tortoise for under £200 Just before Christmas. The all red model was the same price. Bought new from a dealer. Yes. The quoted pricing was the initial MSRP and retail prices. As some models have remained in the supply chain, their prices have declined over time. That’s always a gamble though and depends on how well things sell. I’ve got to ask, where? 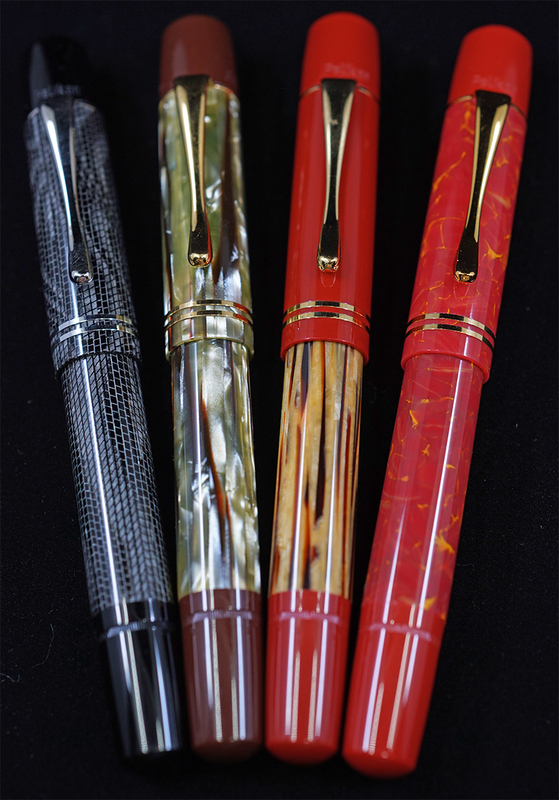 I can’t speak for Bob but Niche Pens list the Tortoiseshell and Bright Red models for £247.50 excluding VAT. May have hit the stated price with a discount code. That’s one of the better prices I’ve seen on these. Yes, it was Niche Pens. They had Tortoise on offer and then a discount code. Was the last one. You got a great deal then. Congrats. Gray is the popular form in the U.S. and grey is the favored spelling overseas. Both are technically correct. I think we’ll know more once we see some real life photos and can really gauge the depth of the finish. Hmmm 🤔, this one hasn’t hut me as a must have unlike some prior initial realeases. I think that is partly due to the available photos and partly due to the muted color scheme. I’m sure there will be people that like the less than flashy appearance. Definitely the opposite feel of the Bright Red. Josh I’m with you. This looks more like a 200 than anything else and the pictures do leave something to be desired. For some of us, with no retailers close by, we will end up buying it sight unseen especially if we want to keep our set complete. The other option is to bet that it won’t sell sell and buy it at a later date on sale. I’m not sure how risky that will be but is something to consider. Very good points. Most of us will buy sight unseen and will have to take it on faith. Waiting on this one may be a gamble or a smart move. Too soon to tell. I’m a bit underwhelmed by this one. If they’d done a vibrant green in homage to the jade 101 I might have been interested. The brilliant red is my least favourite of the four I have, and this one… I’ going to pass on. A jade model sounds like a most excellent suggestion. Definitely one I could get behind. I’ve only got room for 7-8 more Pelikans before I either stop or start selling other pens to make more room. I’m holding out for three M8XX’s, one M1XXX, and four others that catch my eye. This isn’t going to be one of them, I’m afraid. Waiting for the right ones to come along, and I’m not in a hurry. I’m enjoying seeing what comes down the pike though. All three this year are cool pens, so far. Wonder what’s coming next? The M2xx Star Ruby or a new M6xx would be my guess. Will have to wait and see. it looks beautiful but I just cant get used to the 205 currently in my desk compared to the 800s. Same with the Herzstuck… nice looking but too small for me. I can see that. Do you post your pens? These models really have an excellent size and balance when posted which seems to be by design. It’s one of the things I love about them. I do not post my pens because I have found that very fine horizontal hair line scratches appear on the barrel where the cap contacts the barrel when posted. I agree that on some models the posting does give a more balanced feel, but I also would rather not have a pen that has scratch marks. Does anyone else find this to be an issue while posting? I’m with you here Joe. Fortunately my hands are so small that I never have to post a pen, I can even manage to write with the 3xx unposted. That’s impressive. The M300 feel like a golf pencil to me. Can’t imagine not posting it. I have definitely seen that but haven’t experienced it too much myself. A little light polish usually mitigates the issue for me but I can totally understand where you’re coming from. I do not post either but maybe i’ll see if it helps the 205 but think ok i am going to stick to the larger pens going forward. That’s not a bad strategy either. I changed the “Gray” of the original article to “Grey” in order to better reflect Pelikan’s marketing materials. No surprise that they are going with the European form of the word. There is a vintage 101N with a grey binde but it’s exactly that, grey. There are black details in it but absolutely no blue whatsoever. I really think that I would have preferred a straight grey/black marbling on this one. To me that would have been more striking. I don’t know. The blue kind of feels out of place. If you wanted a touch of color, I might have picked another one but that’s just me. I appreciate muted pens as you can use them at work or anywhere without attracting comment. Having said that, this one is rather “meh” and uninspiring to me. Can’t wait to see what they bring out in the M800 line. I haven’t heard too much in the way of rumor on the M8xx front. That’s what news I’m really waiting for as well.